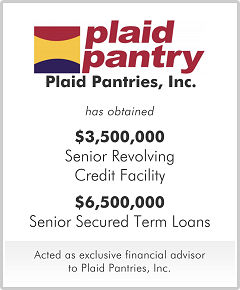 Plaid Pantries, Inc. is a leading convenience store chain in the Northwest, operating 104 locations in Oregon and Washington with annual revenue and EBITDA of approximately $100 million and $4 million, respectively. Citibank had financed a leveraged buyout for former ARCO executives and, as the business plan was failing, Plaid hired Chris Girard as the new CEO. Plaid required capital to repay Citibank and purchase additional inventories. New debt financing of $10 million and an additional $1 million of equity was raised to repurchase Citibank's position, replenish inventory supplies, and accommodate an acquisition led by Mr. Girard. Mr. Girard and the Plaid management team currently own a significant equity stake in Plaid and Mr. Murphy, of M&A Capital, continues to serve Plaid's board of directors.